With Earth Day this week, everyone has their minds on the environment and what we can do to make a difference. I have been featuring some really neat programs offered at Walt Disney World and talking aboutDisneynature’s Monkey Kingdom this week because it is such perfect timing! There are so many great programs that Disney offers in conjunction with the Conservation Fund and there are so many different ways you can make a difference and have an unforgettable experience at the same time! If you are planning a trip to Orlando, I recommend checking out the Animal Kingdom Backstage Tales Tour! In this behind-the-scenes tour of the Animal Kingdom park, you will get a fascinating look at how Disney Cast Members tend to the 1,500-plus inhabitants of Disney’s Animal Kingdom theme park. You will get an up close look at some of the animals that inhabit the Animal Kingdom and learn more about them, as well as efforts that Disney World makes to ensure that they are well taken care of – inside of the facility and around the world! Experience the park’s behind-the-scenes tales and “tails” as you tour the facilities where we care for our animals. Visit the Animal Nutrition Center and see how over 4 tons of food are prepared and distributed each day. Tour the state-of-the-art veterinary hospital, where you may even witness animals being treated. While you are on your tour, you have the opportunity to spend some time in the classroom to learn a bit about some of the things going on at Animal Kingdom and beyond! While you are there, you’ll also be provided with a delicious snack and collectible water bottle! That elephant crispy rice treat was almost too cute to eat – ALMOST! When you take the tour, a portion of the proceeds is donated to the Disney Worldwide Conservation Fund, so you are helping to make a difference too! The majority of this tour takes place in facilities located behind the scenes. While there may be an opportunity for animal interaction, it is not guaranteed. Please keep in mind that this is an outdoor tour. Be sure to check the weather forecast and dress appropriately, including wearing comfortable shoes. Since it can get extremely hot during the summer months, you may also want to bring your own water. Guests must be 12 years of age or older to participate. Please check in at the Main Entrance of Disney’s Animal Kingdom theme park 15 minutes prior to the start of your tour. Please note: You will forfeit the entire price of your tour if you no-show or cancel within 2 days of your reservation. What’s another way you can make a difference today – even if you aren’t headed to Walt Disney World any time soon? 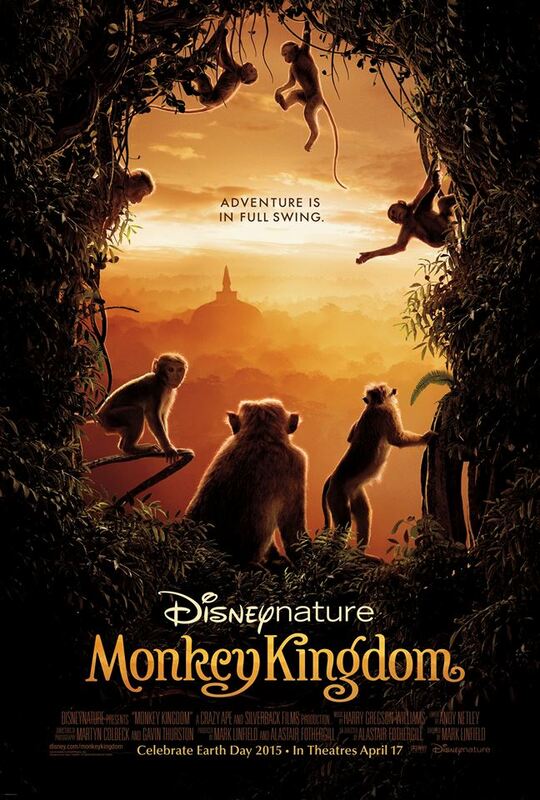 By heading to your local theater and watching Disneynature’s newest film, Monkey Kingdom! When you go during opening week, Disneynature will make a donation to Conservation International to help protect monkeys and other endangered species in their natural habitats!